It took a while, but President Trump’s second State of the Union address is finally here. From one perspective, the fact that it’s happening is more important than the speech itself — it was nearly the casualty of a fight between Trump and House Democrats over funding a wall on the U.S.-Mexico border. Tensions remain high as Congress and the president work toward a Feb. 15 deadline to avert another government shutdown. Trump’s address starts at 9 p.m. Eastern time tonight, and we’ll be live blogging our thoughts in real time at FiveThirtyEight.com. First, though, let’s talk a little bit about how State of the Union addresses work and what you can expect this evening. State of the Union addresses are generally meant as laundry lists of legislation for Congress to pursue — not soaring examples of oratory like presidential acceptance speeches. So it makes sense that, unlike political conventions, State of the Union addresses don’t produce a polling “bounce” for the president — but nor do they take much of a toll. In most cases, their political impact is close to nil. Gallup has measured presidential job approval ratings both before and after State of the Union speeches since 1978 (for a total of 35, not including the addresses before a joint session of Congress that newly elected presidents gave in their first year in office1). If you look at the difference between those pre- and post-speech approval ratings, the State of the Union has produced an average approval-rating bump of … 0.2 percent. In fact, a president has been just as likely to see his approval rating decrease as increase: 15 speeches have produced an approval rating bump, while 15 have yielded a decline (the remaining five effected no change at all). 2018 ratings are based on weekly Gallup polls, whereas other years are based on rolling daily averages. Even when a president’s approval rating has increased or declined in the period immediately following a State of the Union, the shift usually isn’t big. The average absolute change (e.g., treating a 4-point dip like a 4-point rise) has been 2.5 percentage points. Presidential approval ratings have budged by more than 4 points in either direction after only five of the 35 speeches, and in those cases, it’s often easier to attribute the shifts to outside events. For example, the 2005 State of the Union came a few days after Iraq’s first democratic election in half a century, which reflected well on President George W. Bush’s Iraq policy. That should make political analysts think twice when assessing the impact of tonight’s speech. Say Trump’s speech goes well and his approval rating is up 5 points a week from now. 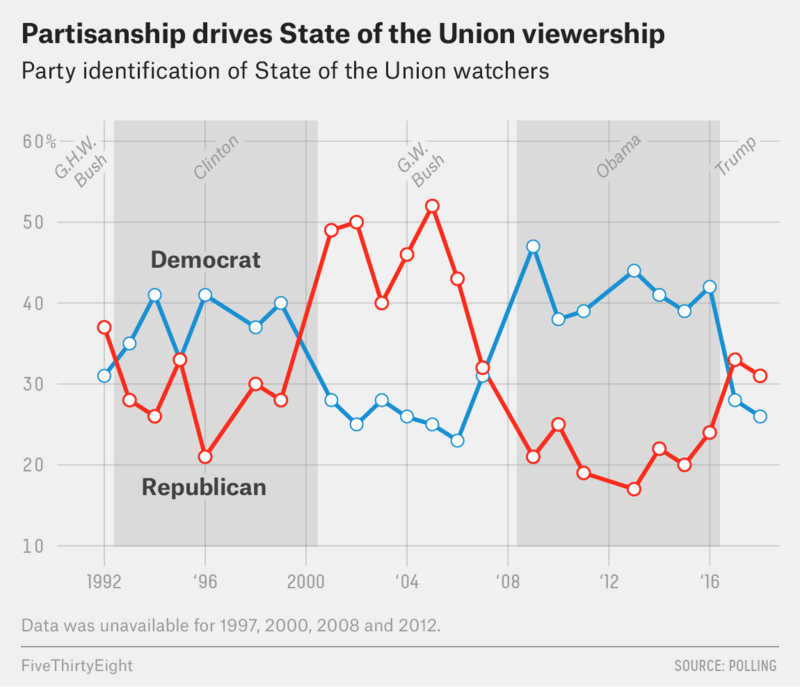 Pundits might try to connect the two, but history tells us that the State of Union probably wouldn’t be the reason behind that increase. That said, don’t be surprised if Trump’s approval rating does improve in the next few weeks regardless of how the speech is received. He is probably due for an uptick — his approval rating fell substantially during the recent government shutdown, but the polling effects of a shutdown have historically been short-lived. Presidents use State of the Union addresses to lay out their policy priorities and persuade Congress to pass them, but they are typically successful at only the first of those objectives. 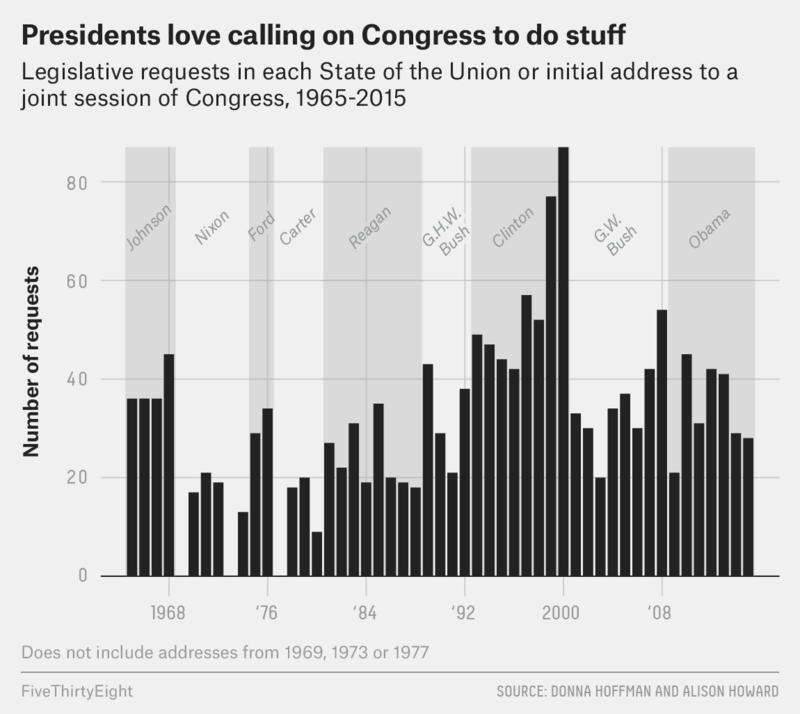 According to political scientists Donna Hoffman and Alison Howard, the average State of the Union from 1965 to 2015 (plus those pesky joint addresses to Congress2) contained 34 policy proposals. It’s particularly difficult for a president to get his agenda passed when his party doesn’t control Congress. For example, 33 percent of the proposals in Barack Obama’s 2009 speech and 49 percent of those in his 2010 speech were fully implemented by the Democrat-controlled 111th Congress, but Obama’s success rate dropped when control of Congress was split between Republicans and Democrats from 2011 through 2014. On average, 14 percent of Obama’s proposals in his speeches in those four years were fully implemented within a year. That doesn’t bode well for Trump’s proposals — one month into the 116th Congress, Trump and House Democrats already have an extremely adversarial relationship. While it’s unlikely that this trend will change tonight — after all, Trump is the most polarizing president on record — voters of all stripes may want to hear what the president has to say in the aftermath of the longest government shutdown in history and as the standoff over the border wall funding continues. Others may have been drawn in by the dispute over when the State of the Union would take place. The importance of the State of the Union in affecting policy or public opinion may be overblown, but it does provide a unique opportunity for the president to speak simultaneously to the public and to Congress. And even though the president is the focal point, the address is really about a president’s legislative agenda, which Congress has the power to enact (or not). Members of both parties sit in the same room and listen to the president. Occasionally, they find common ground. More often than not, they disagree. But a president laying out his or her priorities before Congress is a powerful symbolic reminder that the presidency and legislature are coequal branches of government. 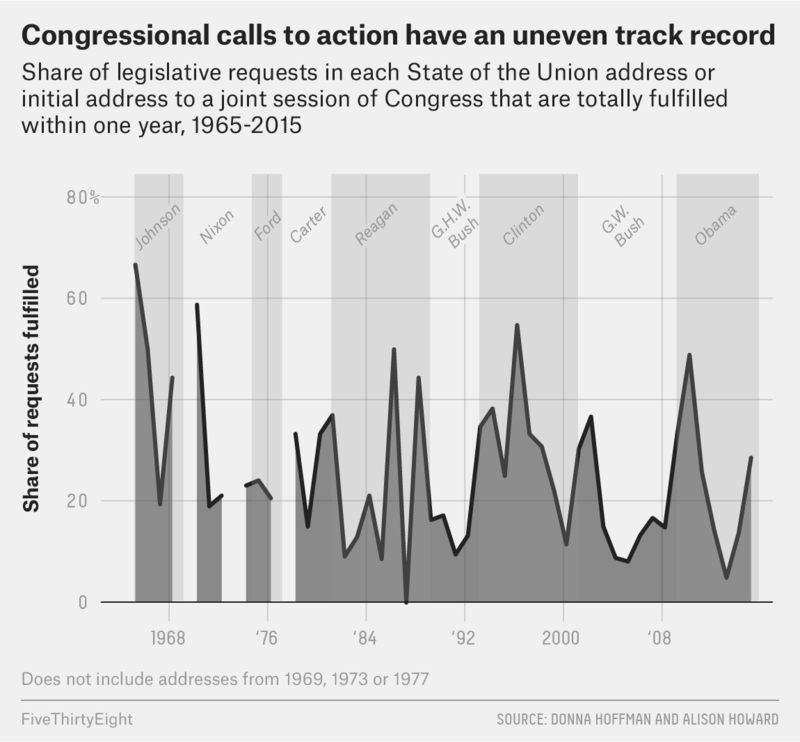 The State of the Union also provides a sense of historical continuity. The address has been either delivered to Congress or submitted as a written annual message nearly every year since George Washington assumed office. And while the televised prime-time address dates only to the 1960s, it does put Trump in the company of former presidents like Lyndon Johnson, Ronald Reagan and more recent predecessors like George W. Bush and Obama. By participating in this ritualized address, presidents signal that they are part of history and that the office transcends any single president. Whether Trump adheres to the usual script tonight or does something, well, Trump-like, the format and setting of the address will push viewers to think about how he fills the office in comparison to past leaders. And at a time when there’s a lot of disagreement over policy, it’s good for the president to go before the American people to make his case, subjecting himself to both public scrutiny and opposing viewpoints. The State of the Union isn’t perfect, but it’s better than the president speaking to the public without Congress present — or, even worse, not speaking at all.